Anne Malcolmson, Grace Castagnetta, and Caldecott medalist Virginia Lee Burton joined forces in 1947 to produce the definitive edition of The Song of Robin Hood. Their triumphant achievement was one of the most distinctive presentations of the legend ever published, and it received a Caldecott Honor Medal in 1948. Through meticulous research and unfailing perseverance, Anne Malcolmson rediscovered fifteen of the original ballads of Robin Hood; Grace Castagnetta adapted them to modern musical notation. Virginia Lee Burton spent three years on drawings to accompany the songs, ultimately producing a work of art filled with exquisite detail and worthy of comparison to the greatest illuminated manuscripts of the medieval era. The text, the music, and the illustrations combine to form a harmonious and timeless work of art. 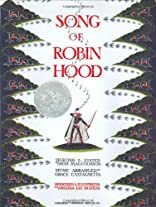 There is no better way to introduce young readers to the legend of Robin Hood, or to renew a love of the tale in the hearts of those who already know the classic story. Lovingly revived and beautifully reissued, The Song of Robin Hood stands as one of the truly stunning books of our time. About Anne Malcolmson (Author) : Anne Malcolmson is a published author and a compiler of children's books. Some of the published credits of Anne Malcolmson include The Song of Robin Hood, Yankee Doodle's Cousins.